When I think about the magic that road trips have wrought on human imagination, I think about Travels with Charley, John Steinbeck’s classic road trip opus. It’s the true account of Steinbeck’s journey by pickup camper with one of his favorite friends -- a standard poodle named Charley -- in search of America. They set out from Long Island, New York, in 1960 on a three-month road trip that took them counter-clockwise around the country, first to New England and then across the northern tier of states to the Pacific Northwest and beyond. Steinbeck apparently thought he had lost touch with his native land, and the road trip was his attempt to reconnect. It was perhaps the first widely read account of RV travel in America, and actually one of the first trips of its type, in a camper that Steinbeck had custom-made. Along the way, the camper got a lot of attention from people who hadn’t seen anything like it before. And along the way, Steinbeck and Charley encountered numerous real Americans living real lives in both ordinary and extraordinary places. Steinbeck’s discoveries and critical insights about them led to the book. I read Travels with Charley for the first time when in my 20s, and it fired me with images that I’ve carried around for the rest of my life. It has affected thousands of other readers the same way. It’s as though we humans are hard-wired by nature to respond in the most visceral way to road trip adventures. Look at the amazing attention people paid to Jack Kerouac’s fictionalized road trip in On the Road, a 1950s stream-of-consciousness account. People still buy it and still read it. More recently, William Least Heat Moon’s road trip account in Blue Highways won great reviews and a faithful following of readers. I think it’s the unstructured aspect of a road trip that appeals to people. It’s the adventure. It’s the thrill of anticipating what lies around the next bend, over the next rise, on the streets of the next small town. We won’t know until we get there. And when we do, what we find may be an honest-to-goodness treasure that will live with us forever. Every day on a road trip is an adventure, as trite as that may sound. That was one of the many rewarding discoveries that Karen and I made on our own road trip. We spent 12 months on the road in the tradition of Steinbeck, traveled more than 30,000 miles to the farthest-flung corners of the country, poked into secret places all along the way. Like Steinbeck, we wanted to discover America -- in our case, the America of the 21st Century, the post-9-11 America. We wanted to find out what it was. Where it was. And we wanted to find ourselves. We succeeded on all counts. I didn’t set out on the road to write a book. But as our travels progressed, I discovered that I couldn’t not write about what we had found. I guess 40 years of daily journalism had had their way with me. All my life, I had written. I’d been paid to write. But what was happening on our road trip was so interesting, the people and the places so riveting, that for the first time in my life I felt compelled to write. 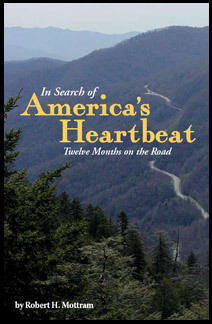 The stories are gathered in my first-hand account of our trip, In Search of America’s Heartbeat: Twelve Months on the Road. “Near the end of a dusty, two-lane road about 10 miles off the Interstate we come to a gate, which is closed and locked. I push a buzzer, and a female voice asks who we are. “And here he comes. We’re about to meet Coyote, who pronounces his name with a long ‘e,’ California style. Coyote wears a fanny pack. Along with a baseball cap and sandals, this is his entire ensemble. He has a beautiful tan. So, what do you need to know to get along in a place such as this? And what is it like the first time you take off your clothes in the mixed company of strangers? It’s little things like these that make every road trip unique. And make every road trip an adventure.